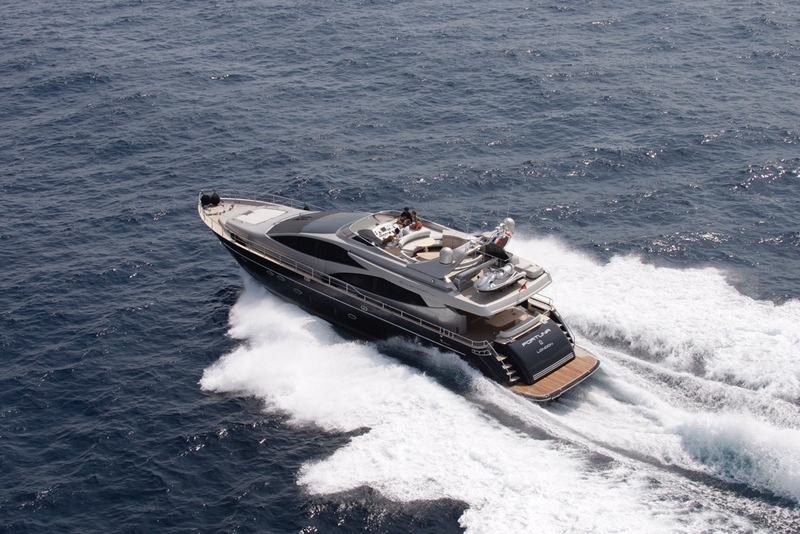 BLACK PEARL AJACCIO (EX FORTUNA OMEGA) is 2009 model Riva 85 Opera, launched in 2008 and refitted in 2017. 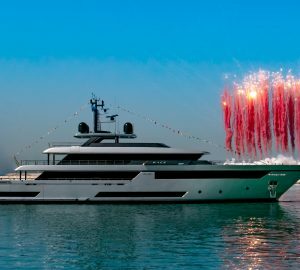 Measuring 26m (85,4ft), she was designed by Mauro Micheli and accommodates up to 8 guests in 4 spacious cabins. 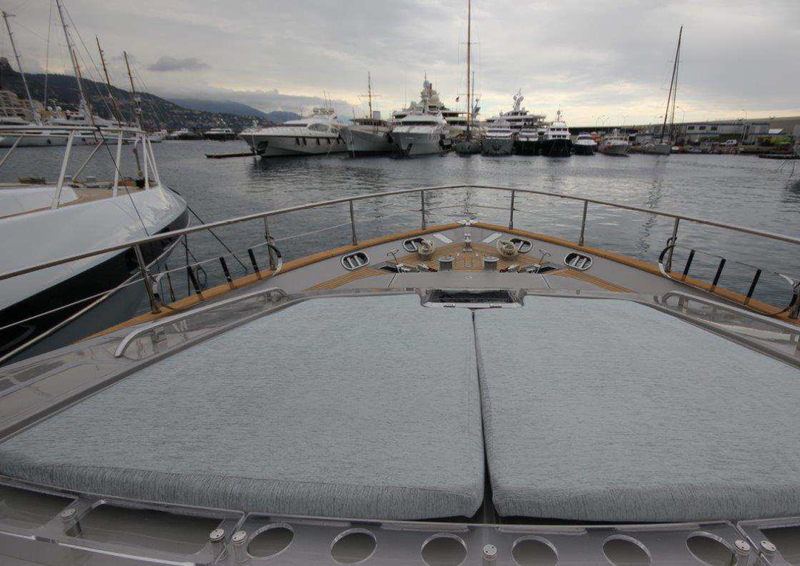 BLACK PEARL AJACCIO is an extremely well-maintained vessel that presents in very good condition. 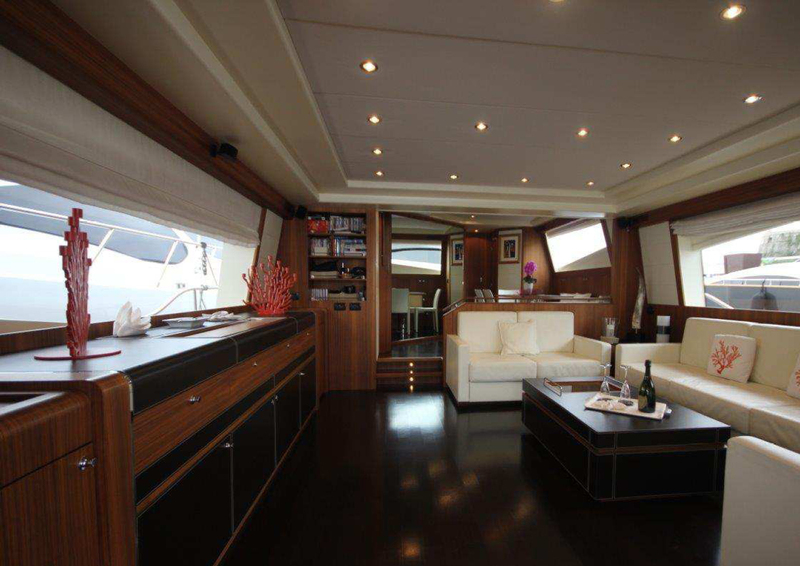 Her interior is quite luxurious and finished in Satin Wenge. 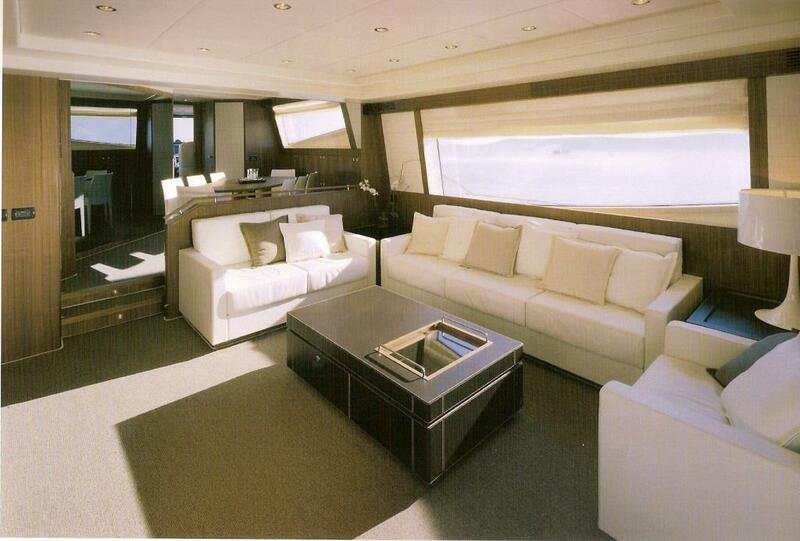 It boasts a comfortable refined salon with large windows and three plush sofas to starboard, around a nice large coffee table. The chic seating area faces a cabinet from which the TV rises. Further forward, only a couple of steps up, one accesses the dining area that is lovely for indoor formal dining, or playing cards overlooking the salon, thus enjoying the company of family and friends. 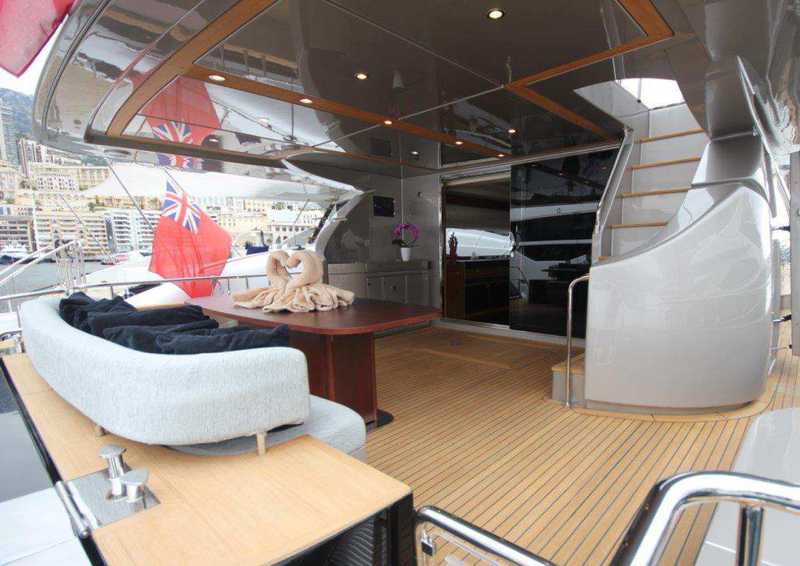 A staircase leading down to the 4 well-appointed cabins is conveniently located between the dining area and the helm. 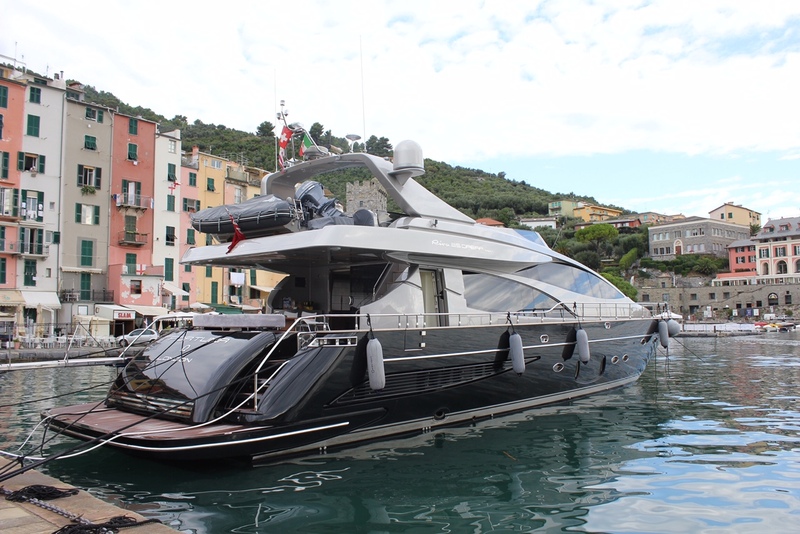 The exterior lines of this RIVA are very elegant too. 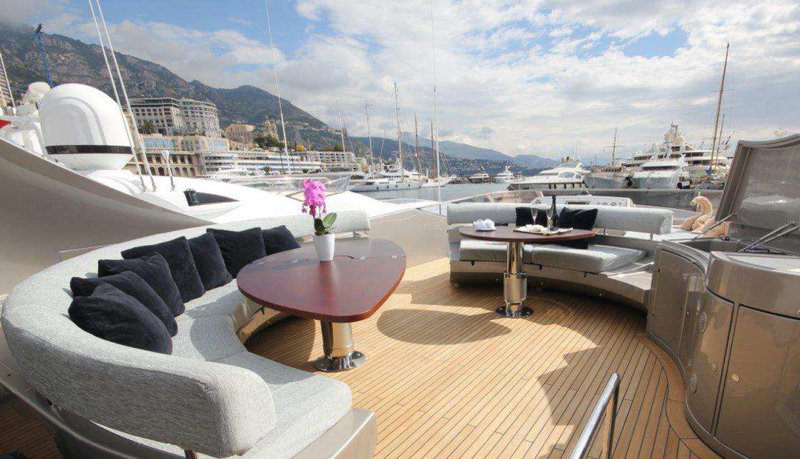 Her expansive cockpit features a covered alfresco dining option with comfortable seating, which is ideal to enjoy cocktails or meals, whilst being protected from direct sunlight. 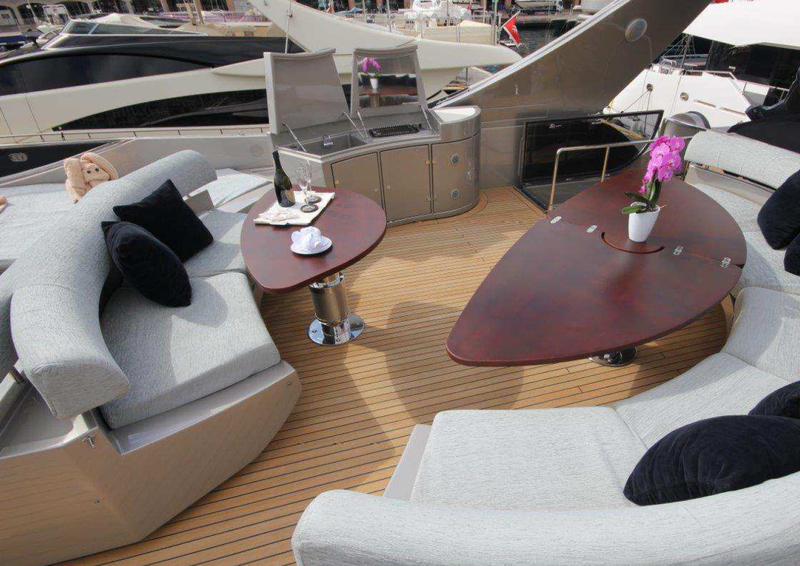 A staircase leads up from here on to the flybridge, where there is ample and stylish seating around two tables, as well as a wet bar and BBQ. This space is fantastic for entertaining out in the sun and for guests who wish to sunbathe. 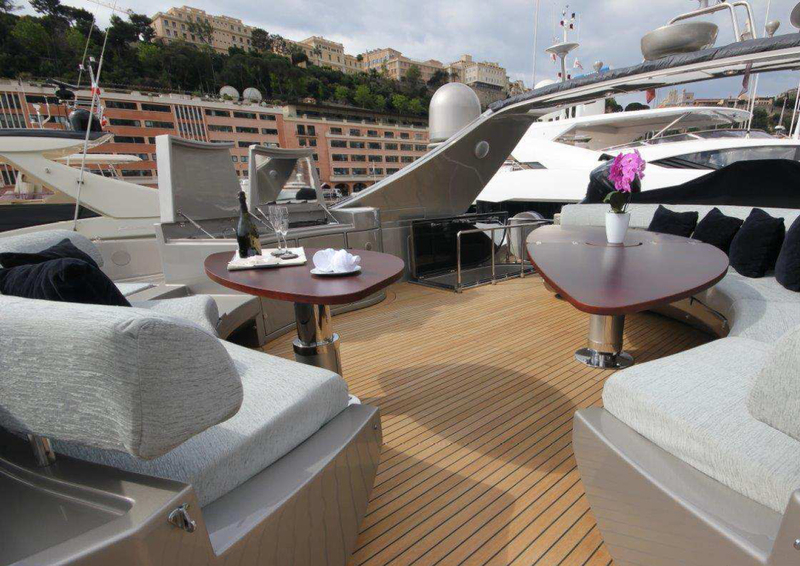 There are sun pads of considerable size located on the foredeck of BLACK PEARL AJACCIO in addition to the upper deck, boasting plenty of areas to relax. 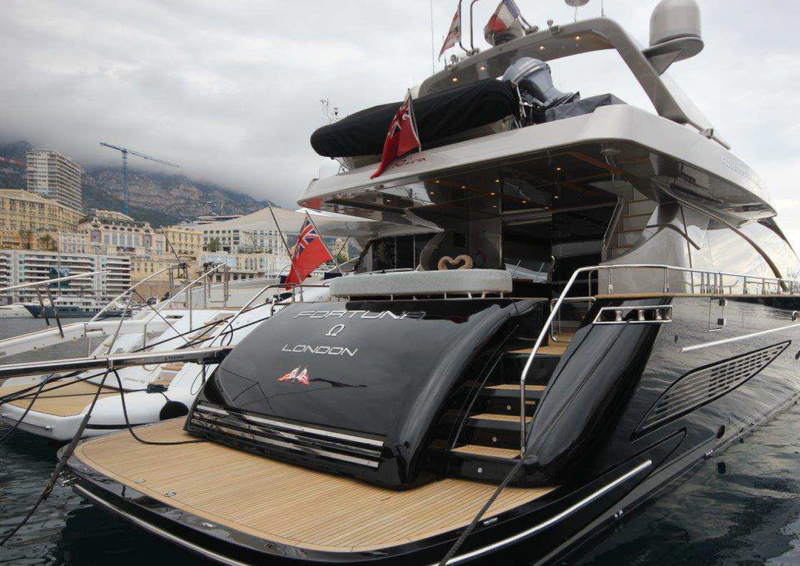 The yacht also has an aft swimming platform that allows for effortless access to the assortment of water toys on offer. 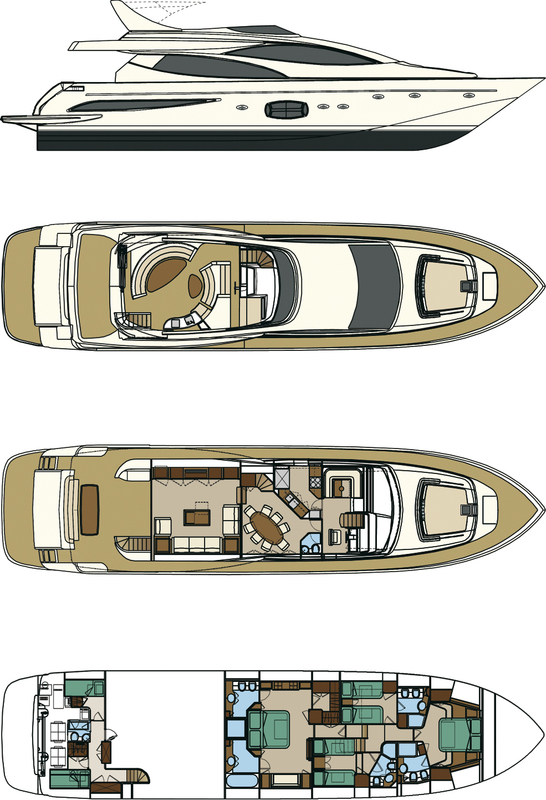 With her 2x2000hp V16 M91 MTU engines, her displacement fibreglass hull and 2 Gyro stabilizers, this yacht is an ideal blend of comfort and performance. She cruises at speeds of 25 knots with top speeds of 32 knots. 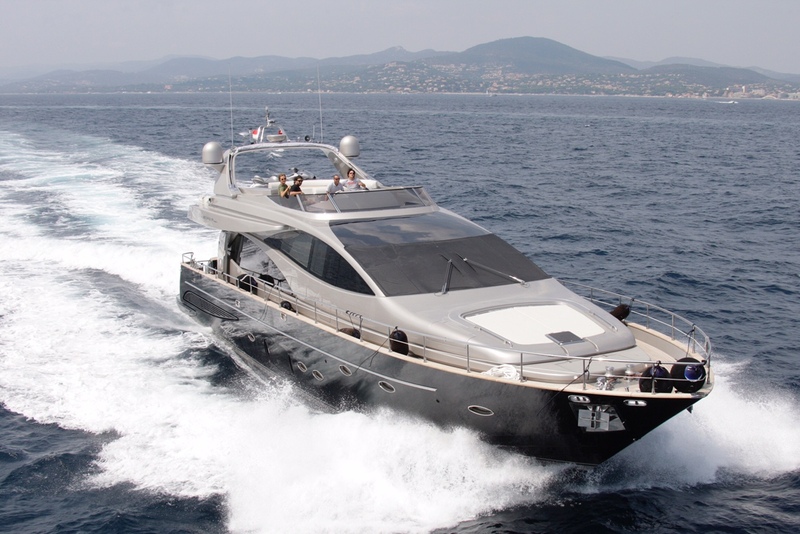 BLACK PEARL AJACCIO has 4 comfortable staterooms that are located on the lower deck. 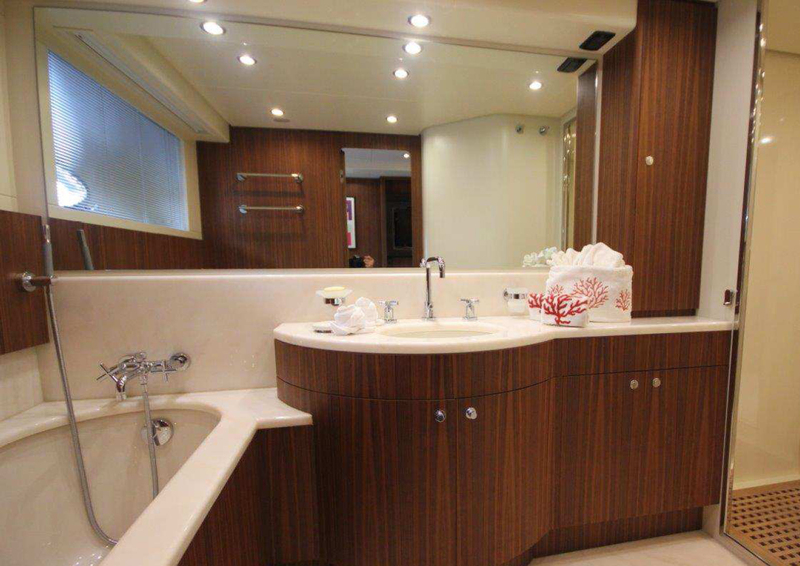 These are all refined and boast their own ensuite bathrooms. 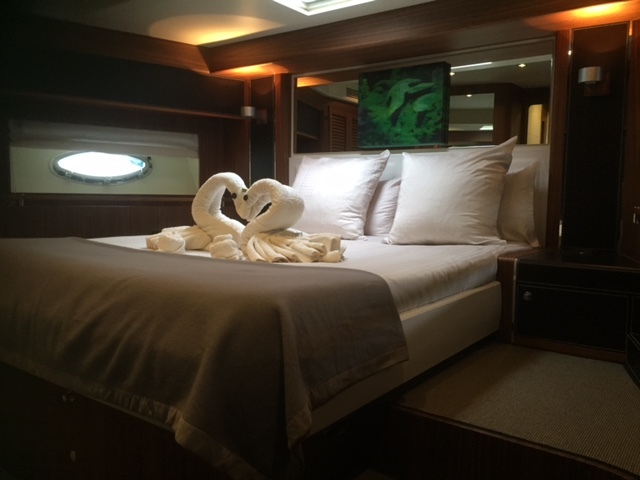 The master cabin is amidships and full beam of the yacht and comprises lovely large windows that illuminate the double bed as well as the settee. 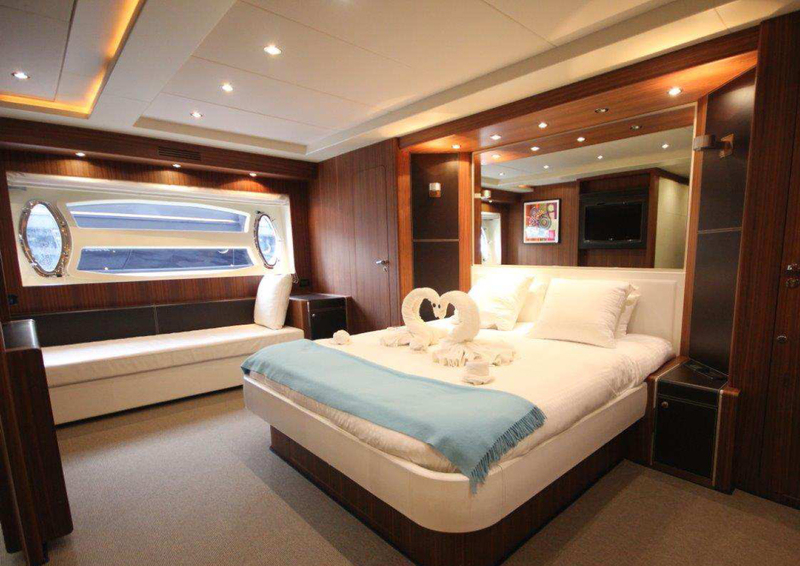 The VIP stateroom is located forward and is also full beam with a double bed and soothing ambience. 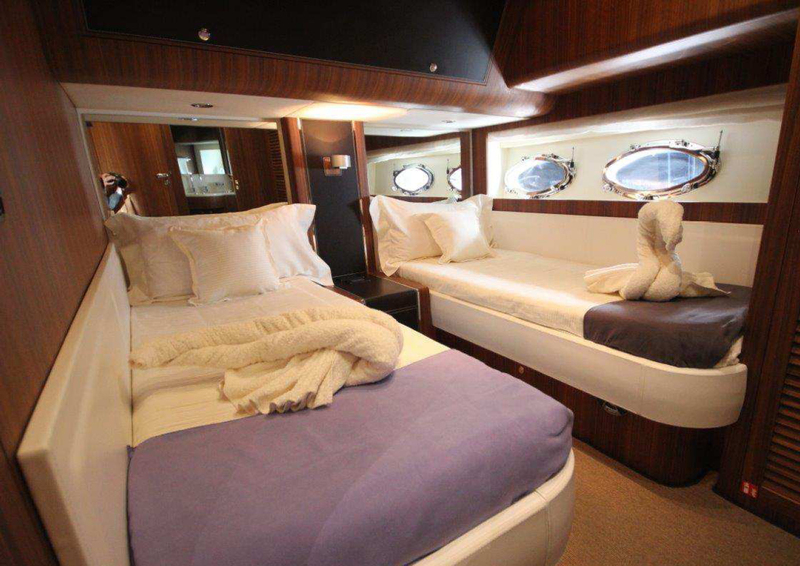 One of the guest cabins is a double, the other a twin, these are both quite refined and comfortable too.